Across the harbour from the historic town of Lunenburg, Nova Scotia is the Bluenose Golf Course where the scenery of the town is stunning from many of the holes. The view of the fishing village is spectacular from the clubhouse. The name of the golf course came from the shipyards in Lunenburg, Nova Scotia where the famous Bluenose schooner was built. The golf course is fairly challenging for any golfer with its sloping fairways and small greens, but the scenery is picturesque. 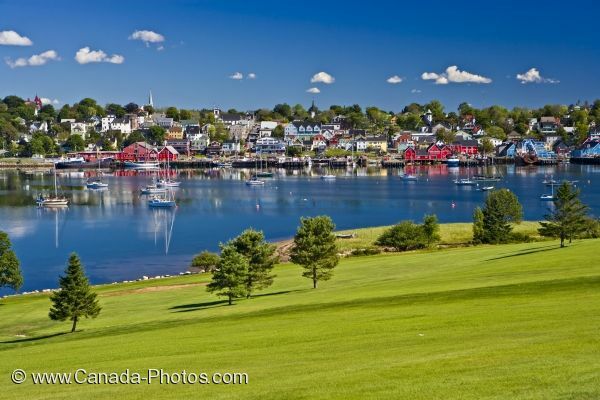 Picture of the scenery of the town of Lunenburg, Nova Scotia from the fairway on the Bluenose Golf Course.